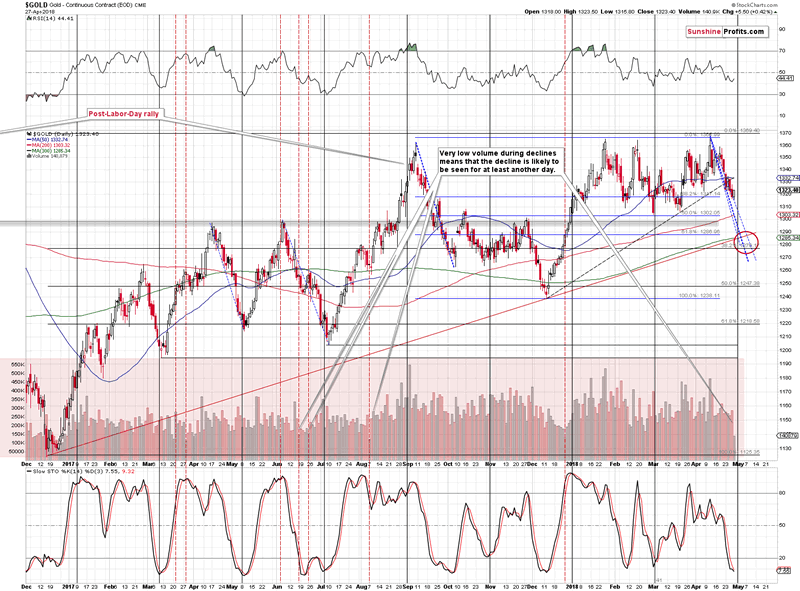 The USD Index reversed in a quite clear way on Friday and gold rallied. It looked like a great bullish combination for the precious metals sector, but was it really one? Gold moved higher on volume that was lowest since the beginning of the year and this means that Friday’s rally shouldn’t be taken at its face value, but instead it should be closely inspected. Moreover, silver just did what was previously followed by big and volatile price moves in all recent cases. What can we really infer from it? Let’s take a closer look (charts courtesy of http://stockcharts.com). The implications of the low gold volume are entirely different depending on the price action that preceded it and the above chart shows it. In general, very low volume during an upswing is a bearish signal, but before accepting what’s usually the case, let’s check if this is indeed the case for the gold market. After all, recklessly applying the general rules like assuming that a rally in silver is bullish (as most analysts do) can be very misleading. We marked all very-low-volume cases on the above chart with red dashed vertical lines. Some of them were seen after a rally and some of them were seen after a decline. On average, nothing specific happened after the low-volume sessions but if you focus on the days when we saw very low volume after a decline, we see a specific pattern. In all cases, gold declined on the following day. Therefore, the price-volume action that we saw on Friday supports the bearish outlook, at least for today. That’s important, because the cyclical turning point is just around the corner and thus one could expect some kind of rebound this week. The session was even more specific in the case of the silver market. The white metal ended the session a bit higher than on Thursday (thus rallying one cent), but it also closed below Friday’s opening price (thus declining on an intraday basis). The Stockcharts website marks such sessions in black. There were only two situations in the recent past when the white metal formed similar candlesticks immediately after a volatile decline: in early March 2017 and in early July 2017. In both cases, silver declined very significantly in the following days. In particular, in July, silver plunged several dollars in just one day. 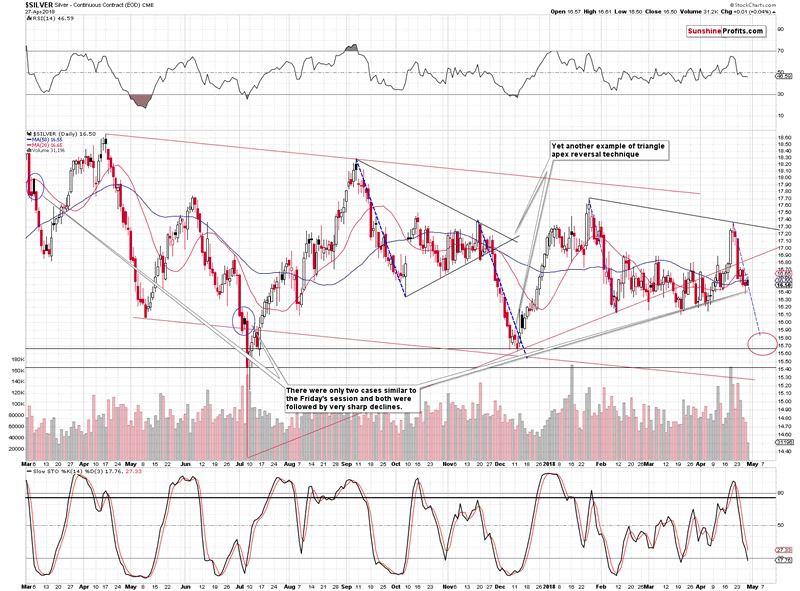 The implications are definitely very bearish for the very short term. The same goes for the fact that neither gold nor silver reached important support levels and thus they should fall further before bouncing temporarily. Gold miners have been quite strong recently, but this might actually have bearish implications here. The reason that you see on the above chart is the cyclical turning point. Mining stocks formed a very short-term bottom last Monday and thus the most recent move was up. This means that the turnaround that one might expect based on the turning point could be to the downside. 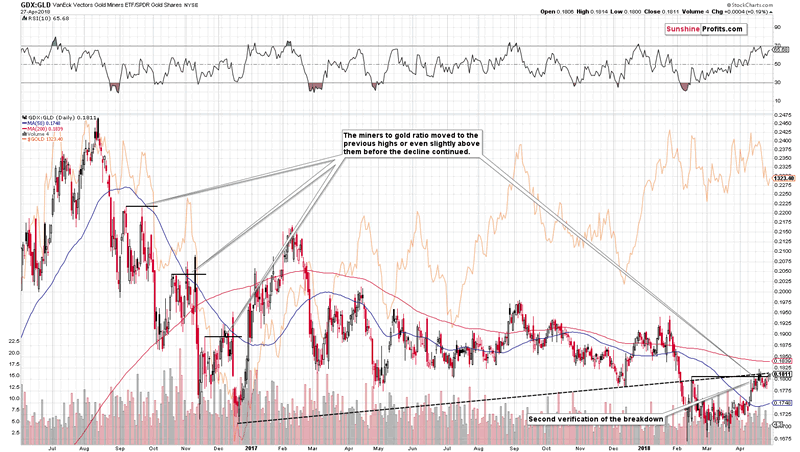 The other reason is the action in the miners to gold ratio. 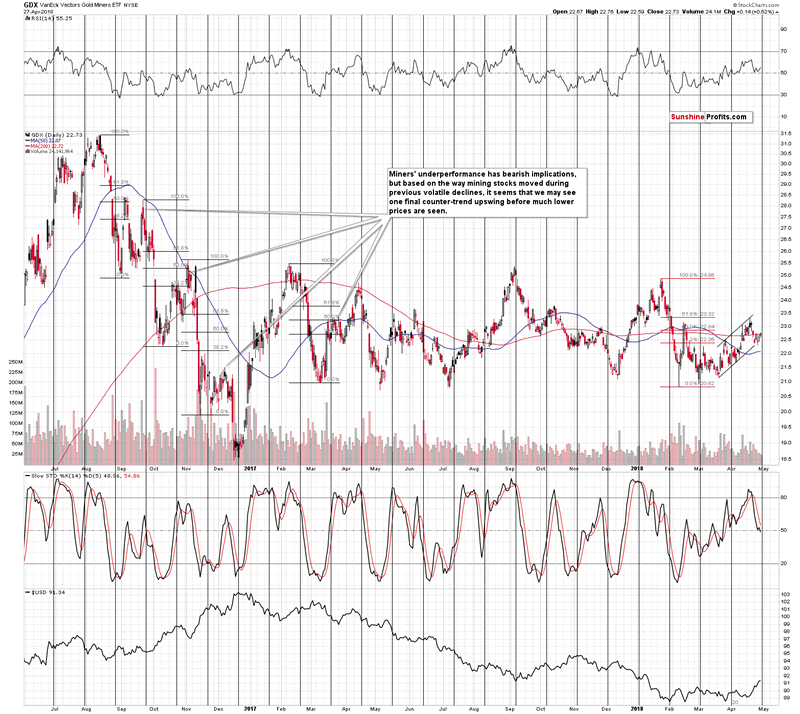 The GDX to GLD ratio once again moved to the rising resistance line and the mid-February high. There was no breakout, so the likely action from here – because of the resistance – is a decline. One of the trading tips for the gold market is that the mining stocks to gold ratio often indicates moves in the yellow metal. At this time, it suggests that one should focus on the upcoming decline, not a bigger rally. Summing up, the situation in the USD Index and the Euro Index suggests that we’ll see a correction, but due to the specific signals from gold and – especially – silver, it doesn’t seem that this will automatically translate into higher precious metals values. It’s likely that we’ll see a corrective upswing in the PM sector shortly based on the cyclical turning points and the apex-based-reversal in the euro, but since no major support levels were reached in gold and silver, it could be the case that the precious metals market will drop further before forming a temporary bottom this week. Please note that the above is based on the data that was available when this essay was published, and we might change our views on the market in the following weeks. If you’d like to stay updated on our thoughts on the precious metals market, please subscribe to our Gold & Silver Trading Alerts.